1. The structure is compact and simple. The jaw crusher has been continuously improved and optimized to ensure the machine performance is improved while the machine structure is simplified. The whole machine is easier to operate, the maintenance is more convenient, and the downtime maintenance time is greatly shortened. 3. Large adjustment range of discharging port. The setting of the discharge port of jaw crusher is ingenious, it does not need to add or subtract the spacer in different crushing process, it can be completed only by adjusting the machine, and the operation is simple and quick. Of course, the user can also change the size of the discharge port by increasing or reducing the number of gasket layers. 4. The crushing ratio is large. The most prominent advantage of jaw crusher is extremely high crushing ratio, which can be described as "full-size feeding". The requirements for feeding materials are extremely low. The dynamic design of equipment enables the material to be broken for many times, which improves the crushing performance and the product granularity is even. The cavity of the jaw crusher is in the form of deep cavity hyperboloid. The structure of negative support, zero suspension, small eccentricity and high swing frequency is matched with the deep cavity type, which makes it achieve high performance, low wear and low energy consumption. The energy saving of single machine is 15% ~ 30%, and the system energy saving is more than double. 6. Components have strong wear resistance. The equipment adopts world-class manufacturing technology and utilizes advanced digital parts to ensure the precision of the machine parts, especially the maxillary crusher produced by red star children, which selects the most high-end production materials, greatly enhances its pressure resistance and wears resistance, reduces the maintenance cost, and greatly extends the service life of the machine. 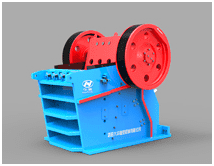 Based on the above analysis, the jaw crusher has unique advantages in terms of structure and performance, as well as in the design and material of the parts. It is not surprising to understand these and stand out in the crushing equipment.